If you couldn’t already gather, we have a serious love of risotto. It is our go-to one pot meal. That’s why we love it so. Throw stuff into one pot, stir, add, stir, and then enjoy creamy-yummyness. That’s a word, right? I like risotto with lots of things, like beets, squash blossoms, Clemson-themed, etc. I love this risotto because it has the usual qualities of a risotto, a creamy texture that melds the flavors together without turning to mush. Risotto or arborio rice (there are other types of rice that are more authentic to use, but this is the closest that is easy to find in any supermarket!) is a rice grain that takes on the flavor of whatever you add to while adding a starchy, velvety component that is hard to find elsewhere. Risotto is a blank canvas waiting to be flavored up to your liking. However, I love this risotto for its differences too. 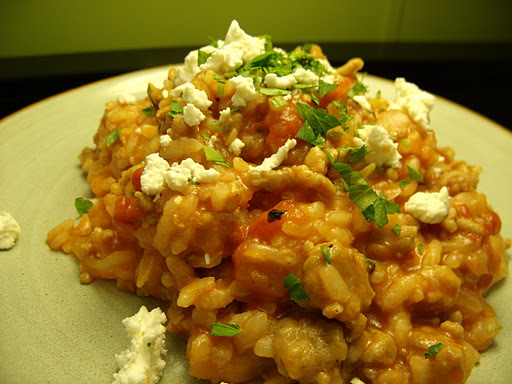 Instead of the traditional water or stock base, this risotto uses tomatoes and tomato juice for a very flavorful and colorful final product. Consistent with the other recipes, I keep a small sauce pot on the back burner of warmed liquid. This time it happens to be the juice from a 28 oz. can of tomatoes plus some water. I love the tangy, slightly acidic flavor this adds to the creamy nature of this dish. The overall dish doesn’t differ too much from your normal pasta with meat sauce flavors, but definitely breaks up the monotony of it. We have made this a few times and enjoy it everytime. So, if you’re looking for something to spice up your pasta night or a different take on spaghetti and meatballs, give this recipe a try! Drain the tomatoes over a bowl to reserve all the liquid. Set tomatoes chunks aside. Combine juice from tomatoes with 3 cups of water in a small saucepan. Bring to a simmer and keep warm on your back burner. 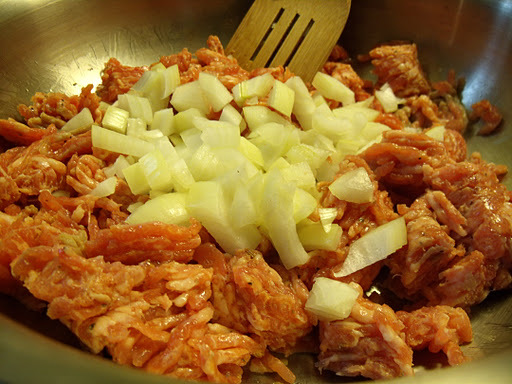 In a large-medium saucepan, heat oil, add sausage and onion, and season with S & P. Cook sausage, breaking it up with your cooking utensil until sausage is pretty much cooked through and onions are softened, 3 to 5 minutes. Remember this will just keep cooking, so no need to cook everything through and through right now. 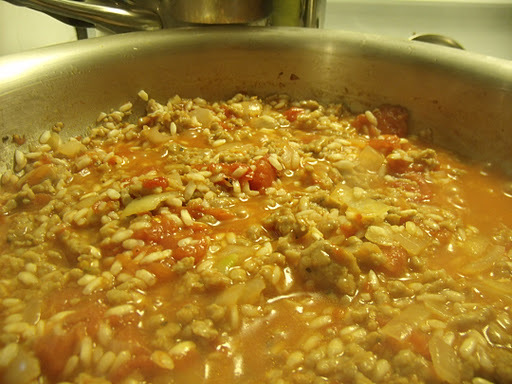 Add rice and tomatoes, stirring to combine and cook for 1 to 2 minutes, letting the rice coat and lightly toast. Add wine. Cook and stir until absorbed, about 1-2 minutes, while stirring. 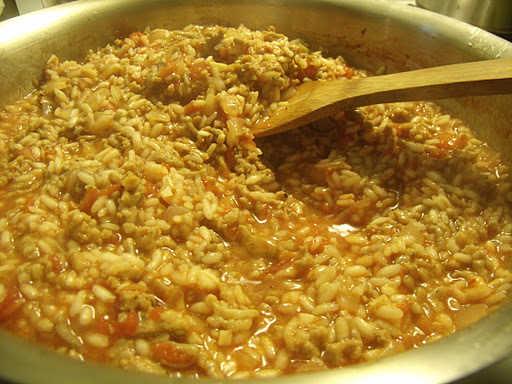 Add about 2 cups or 3 big ladles full of tomato liquid to the risotto. Cook this over a soft simmer, stirring occasionally to re-distribute the liquid and make sure all the rice is being cooked, about 5 minutes. Add 1-2 ladles full of liquid at a time, waiting until the prior batch is almost completely absorbed before adding more. Stirring to combine and re-distribute after each addition, until rice is creamy and tender, about 25 minutes (you may or may not use all of the juice, I didn’t on this batch). Taste testing is strongly encouraged. Remove from heat. Stir in spinach, parmesan, butter, season with S & P and add some crushed red pepper if you like some spice! We served with parsley and goat cheese on top. 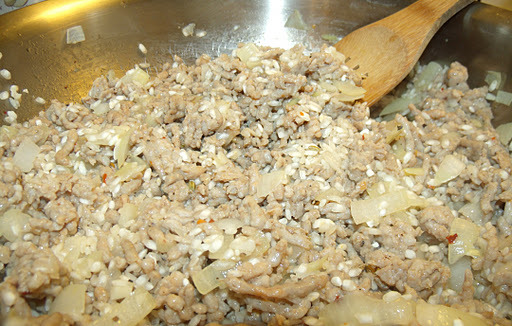 *If you use a gas range, risotto making is much more fun (sorry electric stove peeps). If you don’t feel like using up another pot on your back burner, don’t! Just crank up the heat each time you add liquid and bump back down as it comes to a simmer. You can control the slowness and quickness of the liquid being absorbed. This is called fun in my house. I definitely recommend trying this tactic out. Start with just increasing the heat when you add the wine, bump it back down when it simmers and see how you feel. Like I said, F-U-N! Can't wait to try this! We love risotto!